This lattice headboard from Krylon is perfect for any garden-themed room with soothing green coordinating colors. And adding the Wildflower Swag is super simple too! Choose a headboard with fun lattice or garden motifs. Place headboard on flat work surface covered with drop cloth. If your headboard has a glossy finish, sand lightly to prep surface for pit. Wipe away dust with tack cloth. Apply 2 light coats of primer. Let dry completely and sand lightly between coats. Wipe away dust with tack cloth between coats. Mask off top and sides of headboard with kraft paper and tape, leaving lattice area ready to paint. Apply 2 to 3 coats of Celery. Let dry completely between coats. Remove masking tape and paper. Mask off lattice area with kraft paper and tape. Apply 2 to 3 light coats of Hunter Green to top and sides of headboard. Let dry completely. Remove masking tape and paper. Mask off Celery and Hunter Green areas to add Almond stripe as shown in photo. Apply 2 to 3 light coats of Almond. Let dry completely. Remove masking tape and paper. Id like to see some things on loom knitting. I just got started and I think im Hooked. I'm thinking of adding a drying rack above the closet doors. I love the Garden Theme for my bedroom! Great idea! 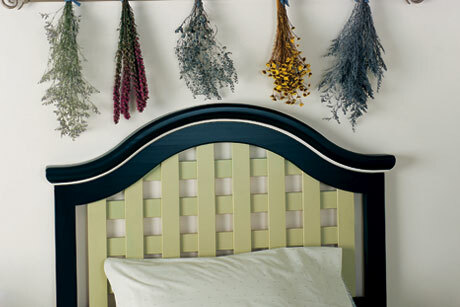 I love the smell of herb's and flower's so I'm going to add a drying rack above my bed for that.